An individual, expressive use of the film medium is emphasized in the Film program. Each year, 28 students learn all aspects of creative film production, from experimental to pre-cinema history. 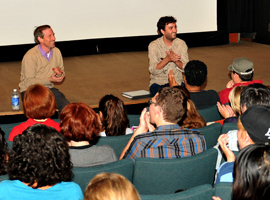 They view over fifty exemplary films, and attend lectures and presentations by visiting artists working in the field. The program is very learning-intensive, and ideal for self-starters who want to challenge both themselves and the boundaries of filmmaking while developing their own critical thinking and artistic visions. 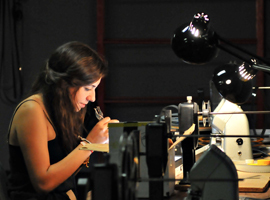 The program is structured to resemble a collegiate BFA course that students typically experience at elite university and art school film programs. Monday through Thursday, students move between classes in Narrative Filmmaking, Documentary Filmmaking, and Cinema Theory. On Fridays and Saturdays, students have production classses, learning various aspects of filmmaking from post-production sound design to art direction. There are also regularly scheduled evening screenings, including a Thursday night, outdoor, Works-in-Progress showcase, where students can screen for the CSSSA community the films that they created in class. This class is an introduction to the principals of narrative filmmaking. Here the students make short fiction films. Drawing from their own personal experiences, these films will mold the students into auteurs. We will go into detail on how camera placements, movement, color, performance, etc. all effect the narrative experience. Each student will make two short fiction films during the course. In this class we will investigate a range of creative approaches to non-fiction filmmaking, considering how different personal, political, and regional concerns are expressed through cinema. We will discuss how cinematography, sound, interviewing and editing techniques can shape our perception of what is true, while students test their ideas through the production of individual documentary projects. Dive into the beautiful world of Experimental cinema. In this course we will de-rail into the underground, avant-garde and surrealist filmmaking only few know and love. Steering away from mainstream commercial media, be ready to pour out your emotions using different techniques to convey your own unique voice on screen. This cleansing will release you and send you off to the world as an artist. Students are exposed to a range of important films from many different movements and genres ranging from the Hollywood musical to Neo-Realism to LGBTI Cinema. This class is focused on discussing the past, present and future of filmmaking and how it can give voice to the voiceless. 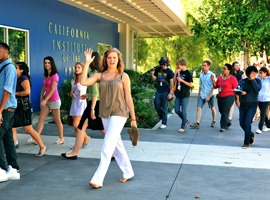 The program also includes field trips that in the past have included tours of Paramount Pictures Studios, visits to prop houses and live film shoots, and public screenings of student works at art houses in the Los Angeles area. Born in Cleveland, Ohio, Frederick Thornton is an established independent film producer, with more than eight feature length films credits, including Lee Lynch’s 2012 dramatic western feature, The Murder of Hi Good. He has won an IFP Gotham Award, AFI Audience Award, been nominated for the Piaget Producers Spirit Award, and has had his films screen in theaters across the globe. He is currently producing a feature documentary entitled L.A. Roll and a narrative feature titled Farewell Tour. Thornton’s latest films are the feature length experimental art film, Day of Forevermore, by Los Angeles based artist Marnie Weber, and a Film Independent Project Involve Short, DROWNING, by Ryan Velasquez. Frederick currently resides in Newhall, California with his two dogs. Experimental instructor Jose Santos is an autodidactic editor and video artist from Los Angeles. He specializes in all aspects of filmmaking, including: Experimental, Visual effects, Super 8mm, and Final Cut Pro. He has editing credits on: The Murder of Hi Good, Pearblossom Hwy, Farah Goes Bang, 20 Years of Madness, as well as the feature length film, Lake Los Angeles. 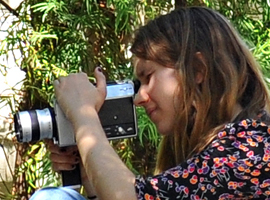 Santos has also worked with artist Marnie Weber, ZAZAZOZO and has cut trailers for Small Form Films. Atsuko Okatsuka is a stand up comedian, actress, and filmmaker residing in Los Angeles. She is the co-founder of Dis/orient/ed Comedy, the first ever all Asian, mostly female stand up comedy tour in the United States. Her stand up comedy credits include having been featured in Comedy Central Presents: Stand Up, Asia!, performing at the Laughing Skull Comedy Festival, being written up in the LA WEEKLY, to opening for Margaret Cho at The historic Wiltern. Her comedic acting & sketches have also been featured in Elizabeth Banks's digital platform, WhoHaha as well as MOCATV where she acted alongside Fred Armisen and Jack Black. She has written, produced, and starred in the Desert Trilogy: Littlerock, Pearblossom Hwy, and Lake Los Angeles which can be seen on Amazon, iTunes, and Netflix. Currently, she is in development for her comedy feature, This Is Chinatown which she will star in and direct. Charlie Schmidlin is a writer and filmmaker from Elgin, Illinois. His writing on film and culture has featured on Indiewire, RogerEbert.com, The Creators Project, and more. He has over 25 credits in feature and documentary films, which have screened at SXSW, Sundance, and LA Film Fest. He currently lives and works in Los Angeles. Davy Walker grew up in Valencia (welcome to Awesometown), CA. During his years wading between school and life, he studied both musical composition and filmmaking. He began studying Film/Video/New Media and Sound Art at the School of the Art Institute of Chicago, graduating with a BFA in studio. It was there he started tinkering with experimental narrative through the musical, new media and tech, and sound collage. Through Davy’s work, he questions the synthetic and natural relationships between music, sound and narrative most often within the fleeting moments of everyday life. His latest work, TheBox made with artist Jack Turpin has shown in Ottawa International Animation Festival and the Slamdance Film Festival, Anarchy Shorts program. His sound work with Cory Feder on her animation, Heavy Blanket lead it to be chosen for Vimeo Staff Picks.